Not all personal injury claims are created equal. There are simple claims that you can pursue on your own in small claims court. Some accidents with short-term injuries are easily negotiated with an insurance company. However, in other cases, it’s not advisable to proceed without the counsel of an experienced and knowledgeable Personal Injury Lawyer. Two determining factors should be the serious nature of your claim and the amount of monetary compensation you are seeking. Many personal injury claims are governed by state and federal laws that are extremely complex and confusing to the layperson. There are rules of evidence, court procedures, jurisdiction issues and a number of other legalities that can cripple your case if not adhered to properly. These serious claims also typically require expert witness testimony to prove your claim, either to the opposing party or in a court of law. The following are examples of the types of claims that you should not pursue without a lawyer. However, even if your case doesn’t fall into one of these categories, if you are unsure of the prevailing laws or procedures for your claim, it’s definitely a good idea to consult with an attorney. Right away! Seriously. 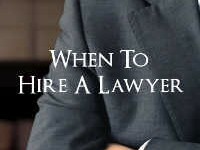 The sooner you have a professional on the case, the better prepared you and your legal counsel will be. It’s important to gather crucial evidence and witness statements as soon as possible. Delays will hinder your ability to build an effective case. The law establishes statutes of limitations for bringing various personal injury claims. If you miss these “deadlines” you may be prevented from ever initiating your claim and recovering compensation. This also puts the opposing party on notice that this is serious and you will not be deterred or “bought off” with an unjust low-ball offer to encourage you to go away. Personal injury lawyers work on a contingency basis and most offer a free initial consultation. You lose nothing by consulting with one to review the facts and circumstance of your situation. An accomplished and reputable personal injury attorney will give you a fair assessment of your case and advise you as to whether you have a potentially good claim and whether his services are necessary. Don’t be deterred from retaining an attorney for your personal injury claim because of the money you will need to pay out of your award. You risk settling for a much lower amount than that to which you are entitled or losing altogether. Seasoned personal injury lawyers have knowledge, skills, resources and experience vital to mounting a successful personal injury claim. Unless you have a law degree of your own, chances are you will be overwhelmed and defeated trying to litigate a large personal injury case without legal representation.